What is a ticket tracking system? A ticket tracking system is a method for reporting problems electronically. When you experience an error, you can report the incident and receive a ticket number. Using the ticket number you can track the progress of your problem until it is resolved by technical support. You can use the ticket tracking system to correspond with technical support, even send and receive files through the system. Why use this system? Why not just call technical support? By submitting an error report to the system, you can easily track and document your problem, and the responses from technical support. Since technical support is alerted each time a report is submitted, you may get a faster response than calling on the phone. What are the transaction fees associated with the UCC Online Filing System? Yes, Revised Article 9 has passed in Arkansas. What about signatures? Is it legal to file a UCC electronically without wet signatures? YES! According to the Uniform Electronic Transactions Act of 2001, the State of Arkansas allows online UCC filings. Please see the Uniform Electronic Transactions Act for more information. YES! You should have a local ISP (Internet Service Provider). Your performance speed will be affected by the speed of your connection. How do I get connected to an Internet Service Provider? There are numerous national and/or local Internet Service Providers. Your ISP may be a local cable company, phone company, or other communications provider. Typical ISP charges range from $10 to $40 per month for service including email and other services. Once you connect to an ISP, there are no additional communication costs associated with UCC electronic filing and searching! What is a Submitter Account, why do I need it, and how do I get one? The Information Network of Arkansas requires all electronic UCC filers to have a Submitter Account in order to use the Online Filing System. To apply for an online account type in http://www.sos.arkansas.gov/corp_ucc_commercial.html in the address line of your web browser. Then click on “UCC Online Search & Filing “, select “New User? Register Here” and complete forms. The annual subscription fee is $95.00. Are fixture filings affected by the change in the law? This change does not affect the filing of a mortgage on the related real property if the collateral is “as-extracted collateral or timber to be cut” or if the financing statement is filed as “a fixture filing and the collateral is goods that are or are to become fixtures”. How do I continue a document that is not recorded with the Secretary of State? Can financing statements be continued or amended online? Filers that wish to file continuations or amendments online should check with the SOS office to determine if their imaging software is adequate for the required document upload. The online filing system has been re-designed to help users through the process with an easy to follow step by step program. 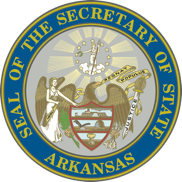 If submitting by mail, then simply send all documentation along with the UCC-3 to the Arkansas Secretary of State’s BCS division. UCC 1(termination included) - $16.00 UCC 3- $6.00 Searches - $6.00 - Please note on filings transferred from the county clerk’s office the SOS will not charge the additional page fee on those copies. However the circuit clerk may charge for the certified copies obtained from that office. What filing numbers will I use to find documents with the Secretary of State’s Office? Once the UCC filing is on file with the Secretary of State’s Office the file will be given a new filing number. From this point forward all references with this office will be conducted with the new filing number. All county filing numbers will not be searchable in the SOS centralized database. Where are farm stored commodity loans financed by the Commodity Credit Corporation of the USDA to be filed? These filings will remain with the circuit clerk until December 31, 2012. Starting January 1, 2013 these filings will then transition to the Secretary of State’s Office. When can a filer continue or amend a UCC financing statement and transfer it to the Secretary of State’s office? Anytime after December 31, 2009, a file may be continued or amended at the Secretary of States office. However continuations will be rejected if they do not fall within the six (6) month continuation window. When I continue a financing statement with the SOS, what will the new lapse date be? When the financing statement is continued with the SOS, the initial filing date will be manually changed to reflect the original filing date. Therefore the new lapse date will be the same as if it were to have been continued in the circuit clerk’s office.